From January 1st 2005 the General Practice will be obliged to respond to requests about recorded information that it holds. The Act creates a right of access to that information, subject to certain exemptions listed in the Act. More information can be found on the Scottish Government web site: www.scotland.gov.uk. The information regarding you is stored on paper or electronically. We need to use some of your personal health information for administration purposes in order to receive payments for services provided to you. 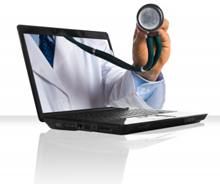 The use of your personal health information is covered by the Data Protection Act 1998. Under the Data Protection Act, you are also entitled to access your clinical records or any other personal information held about you and you can contact the Practice Manager to do this. All staff adhere to the rules governing patient confidentiality and as such laboratory results will only be given to patients themselves or to the parents of minors. Constructive Suggestions or complaints regarding your care, should be made in writing to either Dr R D Humble, Dr M S Stirrat, Dr M Miller or the Practice Manager. A Practice Complaint leaflet is available on request from reception or click on the link below. Written suggestions can also be posted in the repeat prescription / suggestion box which is situated to the right of the reception desk. Patients should attend their appointments at the arranged time. If this is not possible, they should inform the practice as soon as possible. We expect that patients understand that appointments are for one person only. Additional appointments should be made as appropriate. Patients are responsible for their own health, and the health of their children, and should co-operate with the practice in endeavouring to keep themselves healthy. We give professional help and advice – please act on it! All samples must be handed in before 12 noon. Home visits should only be requested for patients who are seriously ill or housebound. It is important to bear in mind that most medical problems are dealt with more effectively in the clinical setting of a well equipped surgery or hospital. Home visits are made at the doctor’s discretion. We ask that patients treat the staff and doctors with courtesy and respect. Bear in mind that reception staff have a very difficult job to do and they are trying to do their best for you. Young people under the age of 16 can consent to medical treatment if they have sufficient maturity and judgement to enable them fully to understand what is proposed. Please ask at the reception desk if you require further information.